I am dubbing this THE SALAD OF THE SUMMER. This perfect tomato panzanella is by far the most made salad in my kitchen right now, beating out the cheeseburger salad, the poppyseed chicken salad and even the house salad. Essentially, this has become the NEW house salad. It is so delicious. When it comes to summer dinner, I am thrilled with tomatoes, basil, corn and maybe some burrata. A drizzle of balsamic glaze. All together or served in meals separately. Add some toast into that mess and I’ve never been happier. Tastes like hot summer nights and smells like summer too. And while I’m certain that I may have called the chicken poppyseed salad “the salad of the summer” (okay, it’s not untrue), I should have been more specific and said it was the salad of the beginning of the summer. 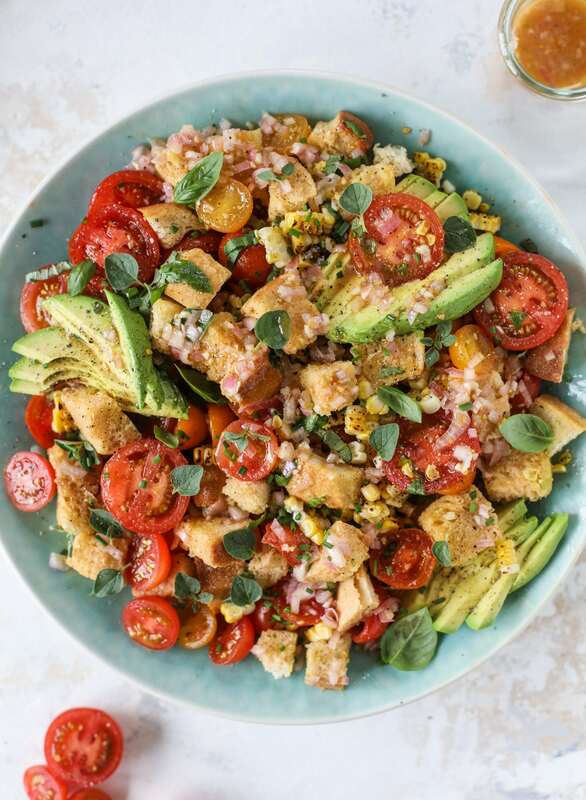 And this here, this insane panzanella salad that is classic but totally delicious and something I could eat every single day, is the salad for the rest of the summer. When tomatoes are bursting with color and flavor and exist as vegetable candy. I first discovered this recipe early last year from serious eats. It’s everything a true panzanella should be – perfectly toasted bread that is soaked with the dressing and served with the ripest and sweetest juicy tomatoes. DIVINE. The way it comes together is too good. You salt the tomatoes and let them hang out in a colander over a bowl for a few minutes. All those tomato drippings? The juice? It’s going to become your dressing base. Isn’t that serious brilliance? I only take a few liberties in the recipe and add some extras, because it’s not like I can help trashing up a good thing. Oh, oh and! While I’m giving you a recipe for this, I have made it countless times without any recipe. Just last week on vacation with farmers market goodness. It’s truly foolproof. My ideal version of this panzanella includes grilled sweet corn (it’s oh-so fantastic right now!) and sliced avocado. This salad is filling and satisfying on its own, but if you’d like to take it to another level, chicken or chickpeas would be perfect. Tuna too! The shallot in the dressing adds an extra pop, and this is coming from someone who doesn’t necessarily want raw onion in her salads. Fresh basil and oregano, chives and garlic round out this plate and I seriously don’t know if there is anything else I love more. It’s ridiculous in the best (summery) way possible. Preheat the oven to 350 degrees F. Spread the cubes on a baking sheet. Toss them with the 2 tablespoons of olive oil. Bake for 15 to 20 minutes, until they are just toasted. Set the cubes aside to cool. While the bread is toasting, place the halved tomatoes in a colander and set it over a large bowl. Sprinkle with salt and toss well. Let the tomato juices collect in the bowl for 15 to 20 minutes, tossing the tomatoes occasionally. Take the tomato juices and whisk in the garlic, shallots, dijon, vinegar and pepper. Stream in the 1/3 cup olive oil while whisking until the dressing emulsifies. This dressing is amazing! Place the bread cubes, tomatoes and chopped basil in a bowl. Pour about half of the dressing over top and make sure all the bread cubes are coated. Taste and season with more salt and pepper if desired. Let the mixture sit for 30 minutes. Place the bread and tomato mixture on a large plate and add the corn and avocado. Add on more dressing and toss gently. Add a ton of fresh oregano and basil on top and serve! That is the PERFECT nickname for in-season tomatoes = vegetable candy. So good. I have a ridiculous amount of tomatoes right now so I think this will be dinner tonight! Yum! I make at tomato And bread side . Cubes of bread tossed with olive and garlic powder are toasted. Remove from oven. add 3 cups ripe tomatos and return to oven until tomatos burst. It’s from southern Switzerland. Served hot or room temp. YES!!! I cannot wait to make this! All of my favorite summer flavors in one giant bowl! another idea is to take the tomato juice from the colander and mix it with Duke’s mayonnaise for a dressing. OH MY at the deliciousness. try it! and yes, it must be Duke’s. no other! Can it possible be better than your Roasted Tomato Caprese Panzanella salad!? That one is my go-to and simply AMAZING!!! i love that one so much too!!! they are different though – shockingly this one has NO CHEESE. what? i know! Hi- I made this last night and was a little confused about the amount of olive oil. “Stream in the 1/2 cup olive oil while whisking”. I use the 2 tablespoons on the bread- which I also added salt, pepper, and garlic powder to because it was very bland. Then I went to add 1/2 cup of olive oil to the rest of the dressing ingredients and realized it was way too much oil and it over powered the dressing and it is all I could taste. Please help!! hi! it’s 1/3 cup, not 1/2 cup! Thank you for the quick response! Looking back I don’t think I used enough tomatoes or salt and then I added too much olive oil! Lesson learned! I love Panzanella salad. My garden is overflowing with tomatoes right now so this will make the perfect (and easy) dinner! Thanks! 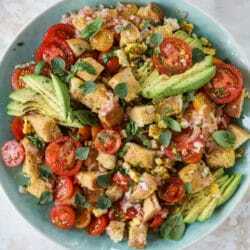 This Panzanella salad looks delicious, Jennifer! I would like to try making this one myself. Can we include boneless meat like chicken cubes in this recipe or do you recommend just using sourdough bread? I was also thinking of adding bacon bits together with the sourdough bread, do you think that would be a nice fit? Thank you! I made this tonight but with pretzel bread because my farmers market always has them and it felt right. It was so good! Hi! Love your site and have used many of your recipes and received rave reviews- thank you! (Also as a new mom, appreciate your Emilia updates & kid favorites). Anyway- if I am making this in the morning to bring tk an evening cookout, can I make it completely and refrigerate it until serving? Or do you recommend adding dressing (and avocado?) when closer to serving time? Thank you! !